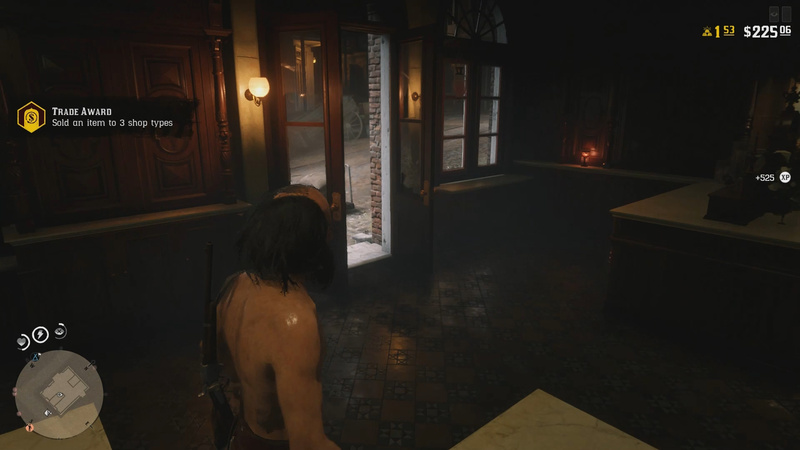 Red Dead Online features its own take on the challenges found in the game’s single player mode. These challenges require you to complete certain goals in order to receive gold and XP bonuses. 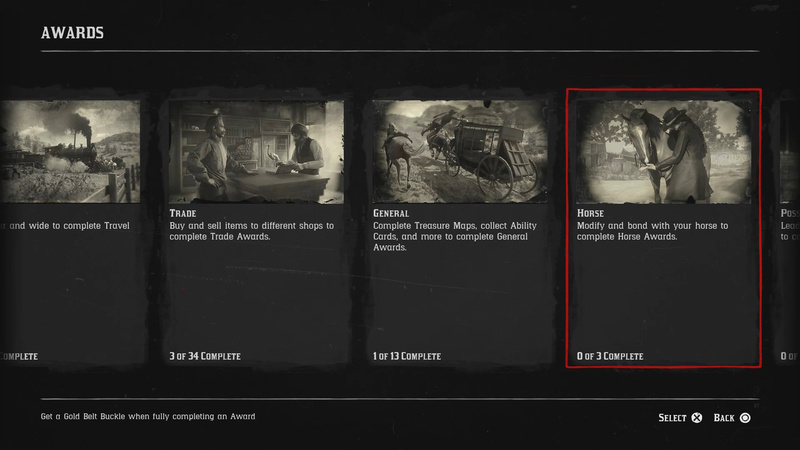 To keep track of all challenges, check out the awards list for Red Dead Online below. 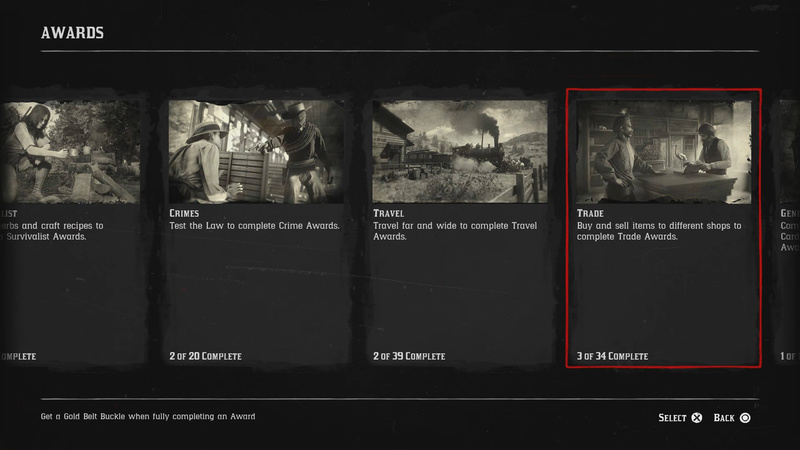 What Are Awards in Red Dead Online? Awards are earned for completing certain activities in RDO. When you earn a reward it will pop up on your screen (as seen above). 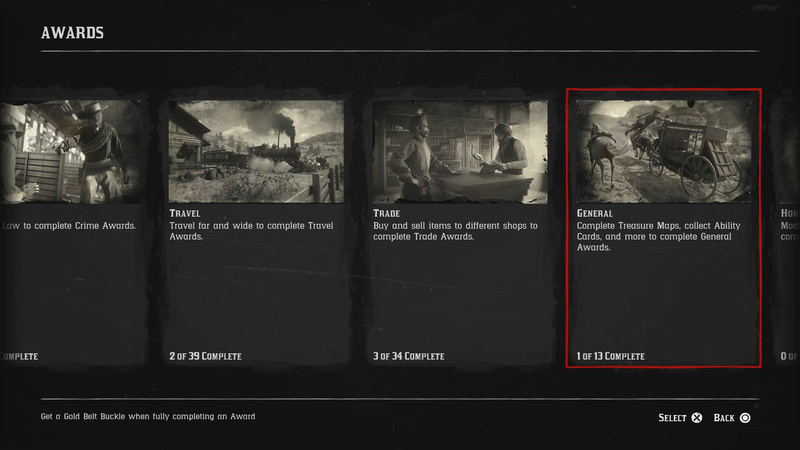 Awards are a type of unlock in Red Dead Online. 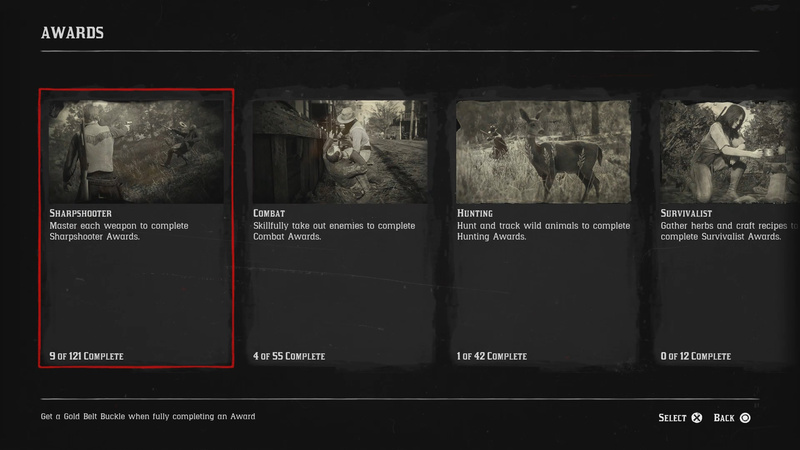 You can earn awards by completing certain milestones in the game’s multiplayer (think single player challenges). There are a total of 425 awards you can unlock across 12 gameplay categories. Within each category there specific awards you can unlock. Each award has different tiers with the highest being a Gold Belt Buckle. For earning the Gold Belt Buckle, you receive XP. Certain awards can be reset so you can complete them infinitely. Resetting an award nets you Gold. The Sharpshooter category has a number of awards for you to earn in RDO. Kill enemies with a pistol (10/50/100/500/1000). Kill enemies with a revolver (10/50/100/500/1000). Kill enemies with a repeater (10/50/100/500/1000). Kill enemies with a rifle (10/50/100/500/1000). Kill enemies with a sniper rifle (10/50/100/500/1000). Kill enemies with a shotgun (10/50/100/500/1000). Kill enemies with a melee weapon (10/50/100/500/1000). Kill enemies with a throwing weapon (10/50/100/500/1000). Kill enemies with a bow (10/50/100/500/1000). Kill enemies with a pistol headshot (10/50/100/500/1000). Kill enemies with a revolver headshot (10/50/100/500/1000). Kill enemies with a repeater headshot (10/50/100/500/1000). Kill enemies with a rifle headshot (10/50/100/500/1000). Kill enemies with a sniper rifle headshot (10/50/100/500/1000). Kill enemies with a shotgun headshot (10/50/100/500/1000). Kill enemies with a bow headshot (5/25/50/75/100). Kill enemies from horseback (10/50/100/500/1000). Kill players from behind (10/50/100/500/1000). Kill enemies using Dead Eye (10/50/100/500/1000). Kill 2 players in a single Dead Eye use (5/25/50/75/100). Kill 10 enemies in a single Dead Eye use (10). Kill 3 enemies with a sniper rifle headshot in 10 seconds (3). Kill 1 player with a bow from 100m (1). Kill 50 enemies consecutively with the same weapon (50). Kill 6 enemies with a revolver without reloading (6). Under the Combat category you will find a total of 55 awards in RDO. Kill enemies by firing from the hip (10/50/100/500/1000). Run down enemies with a coach (5/25/50/75/100). Trample enemies to death with a horse (5/25/50/75/100). Kill enemies with fire (5/25/50/75/100). Kill enemies after you died (5/25/50/75/100). Kill enemies with mounted weaponry (10/50/100/500/1000). Kill enemies while drunk (5/25/50/75/100). Kill enemies who incapacitated/killed a Posse Member (5/25/50/75/100). Kill enemies as a coach passenger (5/25/50/75/100). 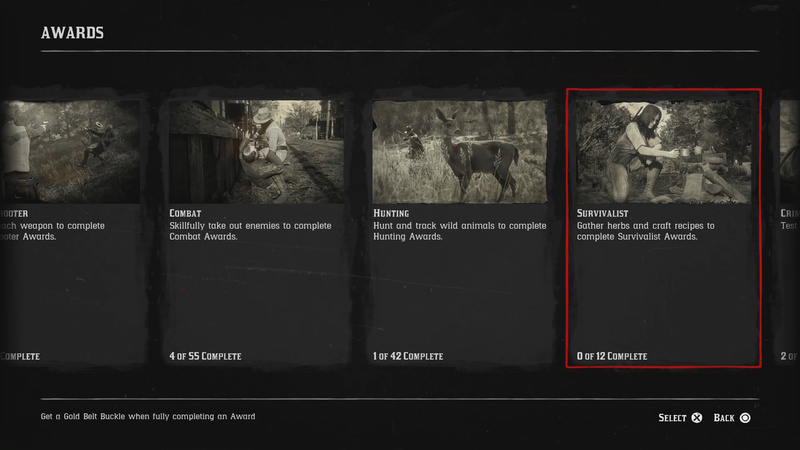 The Hunting category has its own set of awards. Kill 1 flying bird with an arrow (1). Kill 2 animals in a single explosion (1/5/10/15/20). Kill small animals with the bow (10/50/100/500/1000). Kill medium animals with a knife (5/25/50/75/100). Kill animals from a moving train (5/25/50/75/100). Kill 100 types of animal (100). Kill animals who incapacitated/killed a Posse Member (5/25/50/75/100). There are 12 awards in the Survivalist category. Learn unique crafting recipes (20). Commiting crimes can earn you a number of awards. Lasso enemies from horseback and hogtie them (5/25/50/75/100). Drag an enemy with a lasso from horseback (5 miles/25 miles/50 miles/75 miles/100 miles). 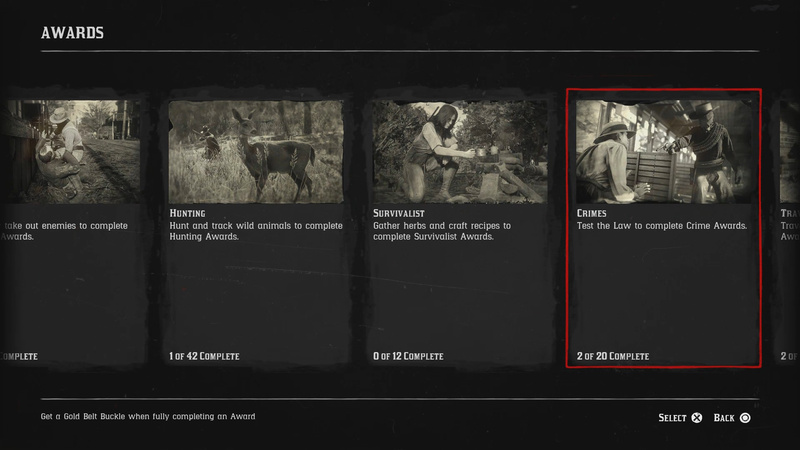 Survive a wanted level (5 mins/10 mins/30 mins/60 mins/120 mins). Lose a wanted level (5/25/50/75/100). 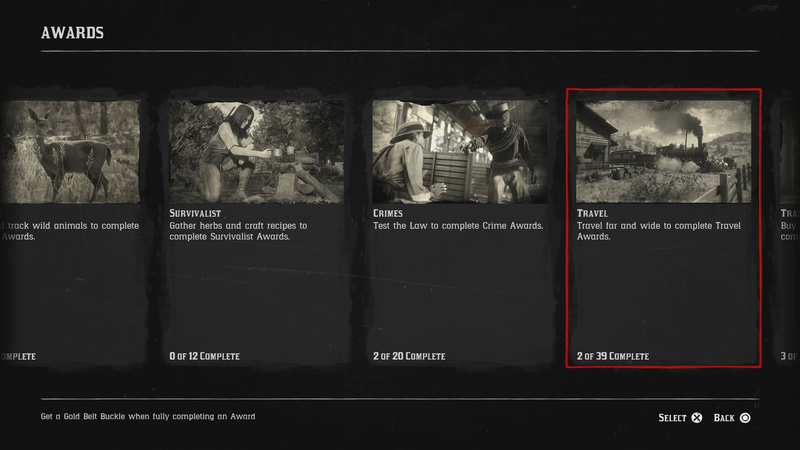 As you travel around the world of RDO you can collect some awards. Travel by train (10 miles/50 miles/100 miles/500 miles/1000 miles). Travel on foot (10 miles/50 miles/100 miles/500 miles/1000 miles). Travel by canoe (5 miles/25 miles/50 miles/75 miles/100 miles). Travel by horse (10 miles/50 miles/100 miles/500 miles/1000 miles). Travel a total of 1898 miles (1898 miles). Jumped from a horse onto a moving train (5/25/50/75/100). Ride on horseback from Valentine to Strawberry in 3:30 mins (3:30 mins). Ride on horseback from Emerald Ranch to Braithwaite Manor in 3:45 mins (3:45 mins). Ride on horseback from Colter to Adler’s Ranch in 1:30 mins (1:30 mins). Travel by coach (5 miles/25 miles/50 miles/75 miles/100 miles). Travel as a coach passenger (5 miles/25 miles/50 miles/75 miles/100 miles). Trade you way to these awards. Purchase 100 unique clothing items (100). Spend cash in shops ($10/$50/$100/$500/$1000). Sell an item to 3 shop types (3). Sell herbs to a Doctor (5/25/50/75/100). Earn 100 gold nuggets (100 nuggets). Collect items from your delivery box (10/50/100/500/1000). Sell animal products to a Butcher (10/50/100/500/1000). Sell valuables to a Fence (10/50/100/500/1000). The General category has 13 awards for you to earn. Find treasure using a Map (5/25/50/75/100). Collect 16 tier 3 Ability Cards (16). There are 3 horse awards you can earn in Red Dead Online. Achieve maximum bond level with your horse. Purchase unique horse breeds (5). Survive a fall of 10 metres with your horse (10). 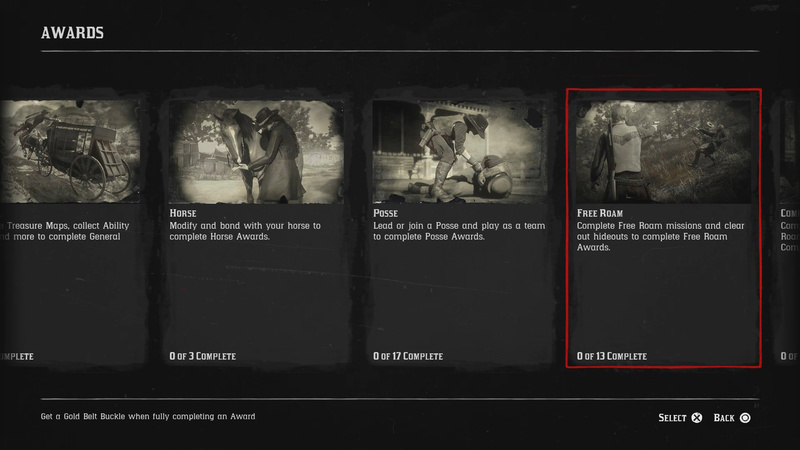 The Posse system has a number of awards attached to it. 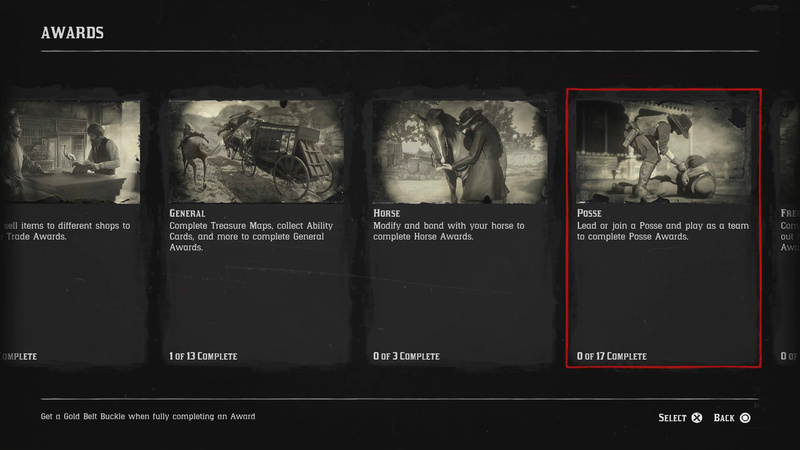 Spend time as a Posse Member (100 hours). Revive Posse Members (10 revives/50 revives/100 revives/500 revives/1000 revives). Complete Posse Versus challenges (10/50/100/500/1000). In Free Roam you can collect the following rewards. Complete Free Roam mission from 10 characters (10/25/50/75/100). Complete Free Roam missions (10/50/100/500/1000). Complete 4 Free Roam missions in a day (4). Clear 4 hideouts in a day (4). The Competitive modes have a number of awards you can unlock. These are the rewards. Place 1st in a Posse Versus (1/5/10/15/20). Place 1st, 2nd, or 3rd in a Free Roam Event (5/25/50/75/100). Win Free Roam Events (5/25/50/75/100). Win 5 types of Free Roam Events (5). 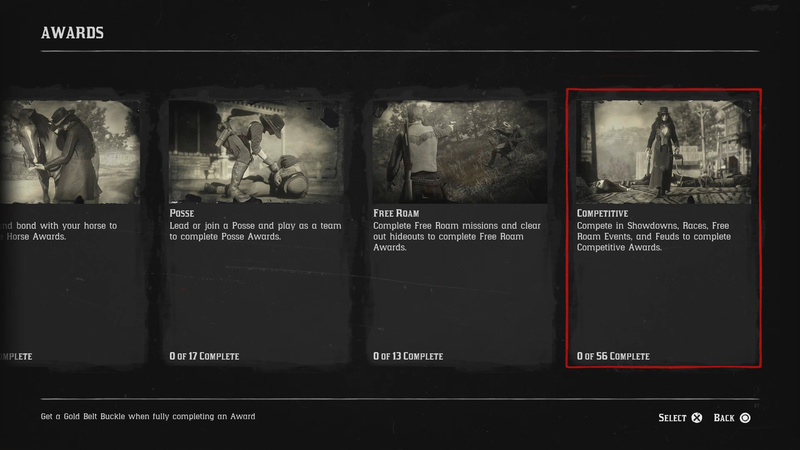 Stop a rival Posse or player from completing their Free Roam mission (5/25/50/75/100). Get the first kill in a Shootout (5/25/50/75/100). Get the last kill in a Shootout (5/25/50/75/100). Did our Red Dead Online Awards List help you? Let us know in The Pit below. So, there’s no downside to resetting an award, and we definitely need to do it ASAP, then?